A UK based strikingly visual performance company. Out and about and looking for love… well a husband at least. 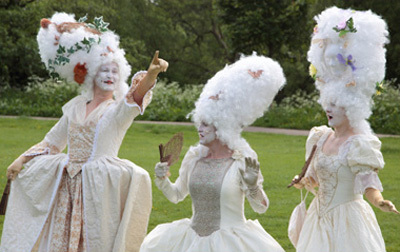 Elegantly ugly and utterly bonkers, these ladies will bring comedy and style to any event. With their big frocks and even bigger wigs, they can’t be missed. These visions in pink will saunter through your event with synchronised precision and elegance. Throwing out quick-witted retorts and a self-obsessed attitude to service, these trolley dollies will turn heads and leave a lasting impression. A family of aliens have lost their way. Trying to contain their excitement at the extraordinary nature of this alien world, the Oozebogs will navigate their way around your event, charming onlookers with their playful antics and innocent curiosity. 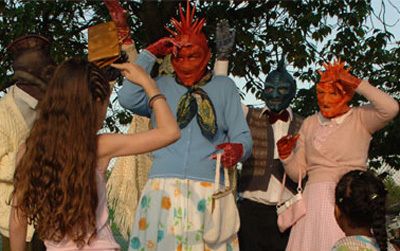 Aqueous Humour is a UK based strikingly visual performance company that has been creating bouffon-style physical theatre since 2001. Aqueous Humour is a darkly comic physical theatre company run by director & performer, Tom Hogan, and designer & artist, Nerissa Cargill Thompson. Over 20 years experience of creating interactive and traditional theatre and running projects, workshops & training. “The work of Aqueous Humour is visionary, bold and inventive.” – Octagon Theatre, Bolton. 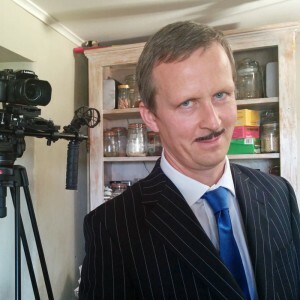 Stay up to date with what Aqueous Humour are up to. See additional photos & behind the scenes info. Go on... tell us that you Like us. Please visit the Aqueous Humour Community website to find out more about all our Community & Education shows, projects & partnerships.